My 8 1/2 month old son just started playing with his new Sassy Pop N Push Car. It makes a great first car! I am glad I read the reviews because the picture does make it look bigger so this video will help you see the actual size. He is just rolling it back and forth, but if you roll it back it rolls forward on it’s own. This is a very simple toy for a crawling infant to use. No parts, no blocks, no switches, just push it and watch the balls pop. Sometimes that’s all they want — no bells and whistles. I bought this for my granddaughter who’s eight months. Even she can do this. 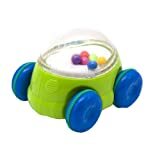 It’s actually a pull-back toy – pull the car back, and let it go…and the little balls pop around. It’s so cute…I like it too! Sturdy and small for little hands. This reminds me of a toy made by a certain maker years ago (don’t know if I can mention their name legally or not so I just won’t) that was on a long stick and you walked behind it and it had bigger balls inside that popped…like a popcorn maker!